2019 is our 10th anniversary year! The school was founded in January 2009. More details will follow. We will be celebrating our Christmas party and singing Kauneimmat joululaulut (Finnish Christmas carols) on the last day of the Autumn Term, 8th December. The party starts traditionally at 3pm and Joulupukki is coming all the way from Rovaniemi. Kauneimmat joululaulut starts at 4pm. The Annual General Meeting will take place on Saturday 6th October 2018 at 4.30 pm, after the lessons have finished. Everyone welcome! We started our school year 2018 / 2019 on 8th September. It was nice to see everyone back after the long summer holiday. Tervetuloa to all new students and families! Hope you’ll like our school! Be warned! Kielipoliisi Pamppunen will be patrolling the school on a regular basis from now on. Any students caught speaking English will be shown the “SEIS!” sign at once. On Saturday 9 December 2017 the Finnish School in the East Midlands will be organising a Kauneimmat Joululaulut (Finnish Christmas carol) service at Robjohn Hall, Narborough. Everyone is very welcome to join and celebrate with us. The service will start at about 4pm. We will be having our Christmas lunch just before the service at 3pm. Again, everyone is very welcome to join us. We are celebrating Finland's 100th Independence Day on Wednesday 6 December 2017. There is still at least one place left and we are taking names for the waiting list in case of cancellations. Also, we have received funding from Finland and only the deposit of £5 is payable, it includes food and a toast. We will celebrate our Christmas party on Saturday 10 December 2016. Tuition will be provided as usual during the first hour, 2pm - 3pm. The party starts straight after the lesson: Finnish and international Christmas specialities will be served and Joulupukki, or Father Christmas, will appear with a bag full of goodies! Everybody welcome, please bring a dish, no presents needed. Kauneimmat Joululaulut, or Finnish Christmas carols, will take place at 4pm. Pastor George Samiec kindly agreed to lead the service this year too. Everyone welcome! Raja 1918 (The Border) (2007) It is a historical drama but a love story and survival story in hard conditions, too. Subtitled in English just under 2 hours, all over 16's welcome. The bar will be open too. Date: Friday, 2 December 2016, at 8pm. We continue working on the Finnish Civil War project. The final outcome will be a website on the Finnish Civil war in English. Anybody can volunteer to write a piece on a chosen subject. Please contact Kirsi if you are interested. A free workshop on the Finnish Civil War will take place on 5 November 2pm - 4.30pm in the Robjohn Hall. Everybody is very welcome to attend. Tuija will lead a workshop for the school children. There will be a documentary on the Finnish Civil War for adults, and a toyroom for the little ones. Our next committee meeting, a short one, is scheduled for 12 November. School dates for the spring term will be decided and announced shortly. The Annual General Meeting took place on Saturday 1 October 2016 at 4.30 pm. Welcome to the new Committee members, Tuija and Lynne! · Adults' Group (beginner / intermediate level) - learning Finnish as a foreign language. The Finnish School re-opened after the summer holiday break on 3 September 2016. Welcome back everyone and Tervetuloa to everyone new who has joined us! Pikkujoulujuhlat (Early Christmas party) will be celebrated on Saturday 29 November 2014 after our first lesson. Finnish specialities will be served at 3pm and we start singing Kauneimmat Joululaulut (Finnish Christmas carols) at 4pm. Pastor Tapani Simojoki and Joulupukki have promised to attend. Everyone welcome! The Annual General Meeting is scheduled for Saturday 1 November 2014 at 4.30 pm. All members and students are very welcome to attend. We hope everyone had a great summer. Finnish School opened again on 6 September 2014. Welcome back everyone and Tervetuloa to everyone new who has joined us! Updates will follow so please keep checking this website or follow us on Facebook (Finnish School in the East Midlands). This year we celebrated Midsummer on Saturday 21st June 2014 at the Estonian House in Leicester. As is traditional, we shared a lunch. It was mainly burgers and sausages this time, as we were able use the BBQ facilities on site. The bar was open and Estonian beer, long drinks and soft drinks available to purchase. It was lovely to sit outside and enjoy the sun on the longest day of the year. A big thank you to everyone at the Estonia House for letting us use their fine and spacious establishment. The spring term finished on 24 May 2014. "First work, then fun" was our motto on that day so in the first hour everyone had their lessons as usual. After that the end-of-year celebrations began in school. Pot-luck lunch was enjoyed and there was plenty of delicious Finnish specialities such as fresh salads, karjalanpiirakka, cakes and berries. Finally, a drawing contest "Summer in Finland" took place, the main prizes being two chocolate houses (suklaamökit). It was very difficult to choose winners as the children drew beautiful Finnish landscapes, very interesting oversized mushrooms or bumble bees and even star flights ("Tähdenlentoja"!). Suklaamökit were awarded in the end to the winners as well as chocolate lollipops to all the runner-ups. We celebrated this year’s Vappu (May Day) on Saturday 3rd May 2014 on the meadow in Hugglescote, next to Hugglescote Primary School and to a playground. The weather forecast sounded rather miserable, with cold and windy weather predicted, but luckily it was mild and sunny! We enjoyed a Finnish pot-luck lunch and sima and the children were able to run around and exercise on the climbing frame nearby. It was lovely to meet a new Finnish-British family from Lincolnshire! Our last session before Christmas took place on 7 December 2013. 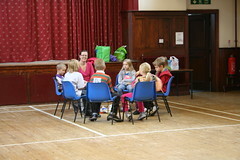 All groups had their first lesson as usual. The party started at 3pm with our pot-luck Christmas dinner (the best karjalanpaisti in the world was served!) and was followed by each group's Christmas presentations and a raffle. Exciting prizes such as books, CDs, calendars, woollen socks, glögi and a gingerbread house were available to be won! Finally, Father Christmas arrived and brought every child a small surprise bag. Due to his entirely coincidental resemblance to an adult known to them there were some unfortunate comments from the children ("Me tiedetään kuka sä oot! Sä oot Maryn isä!") concerning Joulupukki's true identity - all of them unfounded of course! Santa's reindeer had to wait outside for Health and Safety reasons. On 6 December 2014 our school, along other Finnish schools abroad as well as expatriate Finns, received a message from President Sauli Niinistö. Adults' Group (beginner / intermediate level) - learning Finnish as a foreign language. 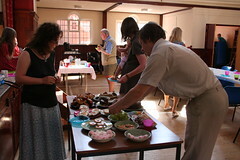 Our traditional midsummer gathering took place in Thurlaston at Kirsi's and Tuomo's on Saturday 22 June. 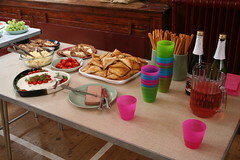 Our End of the School Year Celebration took place on Saturday June 8 the traditional potluck lunch. Different school groups presented programme and the students got their certificates. 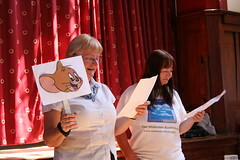 We will continue providing lessons for adult learners during the school year 2013/2014; the teacher is Magda O'Malley. The autumn term started on September 7, 2013. These lessons are usually held every fortnight (check our School Dates for further information). Adult lessons are paid in advance and the current fee is £35 for the Autumn term and £50 for the Spring term. For further details, e-mail eastmidland.finns at gmail.com. The pastor of the Finnish Church in London Teemu Hälli visited Leicester for the second time on February 2, 2013. A Lutheran service in Finnish took place after the normal school hours. 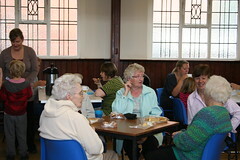 The service was well attended with about 25 persons present. 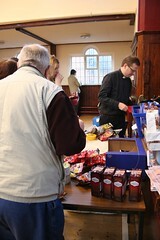 There were also Finnish products for sale, brought from London. 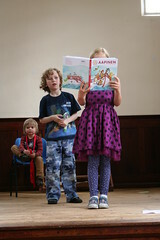 Our School was able to organise a third theatre workshop for older Finnish children. This workshop in Finnish took place on Saturday January 12, 2013 during our standard school hours. All school members were welcome to come for a cup of Finnish coffee and chat. Our student also took part in the theatre weekend workshop in London during the first weekend of the Leicester half-term. 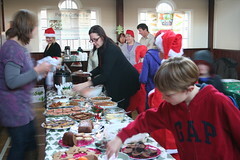 Our traditional Christmas party took place on December 8 after the first lesson at 3 pm. 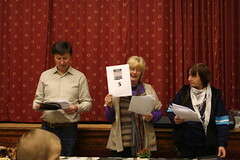 First there was a potluck Christmas meal and then we enjoyed the programme presented by different groups, including the contemporary 12 days of Christmas translated and performed by our intermediate adult learners. The school will constantly need a number of new teachers and assistants. Please, pass the word to any suitable fluent Finnish-speaker. The teachers do not have to teach every school date and holidays and work duties are accommodated. More information from Kirsi (kirsituomo at gmail.com). The Finnish Saturday School in the East Midlands organized autumn half-term theatre workshops for children on October 25 and 26. These provided extra activities for our older children and allowed toddlers to play with some of the new toys and watch films on the new school laptop. 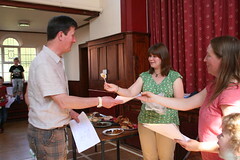 Our end of the school year celebration took place on on Saturday 26 May after the first school hour. 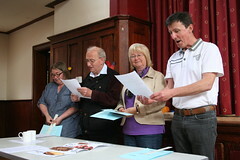 After a plentiful potluck late lunch there was an excellent programme for the audience presented by our smaller and adult learners. The celebration ended with all our students getting their certificates. The music group for all under 6's will continue to take place at 2-2.30pm. 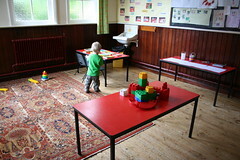 The junior group and pre-school will play in the hall the first 15-20 minutes. Normal programme with learning and crafts after these activities. Please, arrive promptly not to miss the fun. 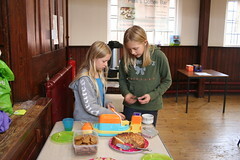 Our school organized a fund raising event on June 18, 2011, at 3-5pm in the Robjohn Hall in order to make our contribution towards the Narborough Congregational Church Boiler Fund and a new boiler for the Hall for next winter. We had a fun day for both adults and children with a sauna talk, fishing, story corner, cafeteria with cinnamon buns, raffle, Father Christmas and more.